Here's a treasured "snap-shot" taken in the mid-'60s: Glen Campbell was nervously waiting to go on stage for a TV appearance at Panther Hall in Fort Worth, I was the emcee of the show. I did a bum job of snapping the picture because the director of the show was yelling for us to rush on stage, the theme was being played! I've often wished I could have had someone else "click" the camera and I could have joined Glen in the picture. I never had a picture made with this awesome, talented super-star. 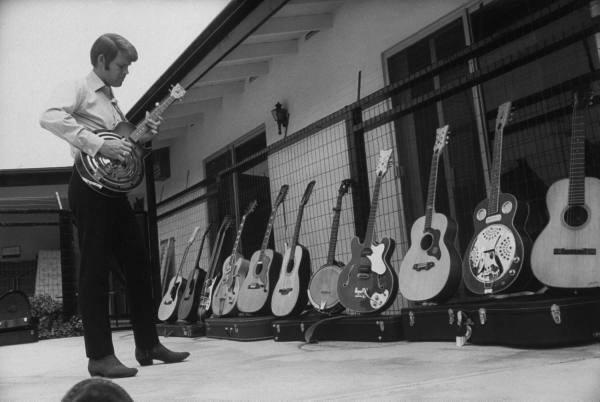 The black and white 1968 photograph, of Glen with his guitars by his pool, is a testament of how much Glen appreciated the stable of guitars that he owned at that time. A good portion of these guitars were Mosrite's. In this picture, the fourth guitar from the end (r) is a Mosrite Celebrity I. In 1964 Semie Mosley (original creator and owner of Mosrite) decided Mosrite should offer a hollow body electric. He took a Framus body and created the Celebrity model. Soon after, he wanted a thicker bout version and created the Celebrity I (one). The Celebrity Glen had was probably produced around 1968. Glen's Californian was basically a Celebrity with a resonator. Although there may be others...I have only come across one picture of Glen using his Celebrity.